Hello friends! It's a busy time and I have my hands full with the growth of my school. It's all good only it takes me away from posting as much as I would like. It also takes me away from drawing and art in general but I'm working on it! Meanwhile here's what I came up with a few days ago while helping a student understand how to draw straight ahead with a ball point pen. Wish it could be more but at least it's something new and I'm keeping my Crash chops up. As always thank you for checking in and I'll be following up again soon. 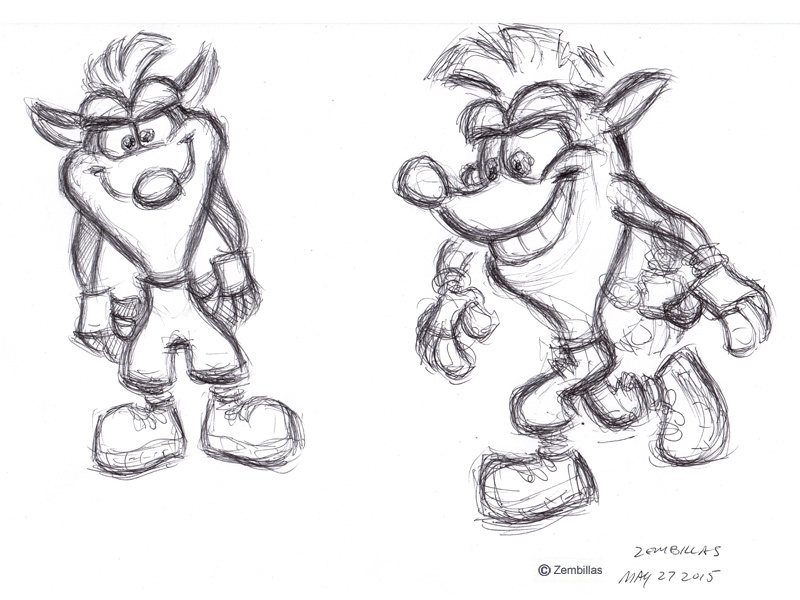 Found this blog looking through some old Crash concept art. Finding the blog of the guy who's behind the designs of a bunch of my favorite video game characters is really thrilling and I'm glad he's doing well, consider me and my buds fans. Got you bookmarked and will be visiting frequently! Great skecthes as always :D. I have a question: Looking at the designs for the Crash Bandicoot characters that you and Joe Pearson designed I noticed that they all respect some "rules", like none of them have visible furr (except for Dingodile in the concept arts). So I wanted to ask which are the characteristics of a Crash Bandicoot character? What makes Crash's designs stand out from other cartoony games? I would of thought there would be no need for detail such as fur because the Playstation wasn't that technologically advanced and wouldn't have the power to handle so much detail(don't forget that this was 95/96) especially since the characters in the game were made up of polygons and the Playstation could only handle a certain amount which included characters, items, backgrounds.. etc. Hello Gabriele and Stephen and thanks for your positive comments. You pretty much nailed it Matt. The polygon limit per character on PS1 Crash games was 500. Compare that to Jak & Daxter for PS2 at 10,000 per character. It all comes down to the use of shape. Even with textural detail and all that, what happens at the foundation is what matters the most. That's where you get real results with the look of characters. Effective utilization of shape is at the core of the art of character design. Everything else enhances the graphics. So that's the reason why the concept art for the enemies make them look more "angular" right? To help the 3D artists, keeping in mind the limitation of the console. Well it makes sense, the CNK characters had a lot more details, especially Emperor Velo, but they still look cartoony enough; I especially like CNK's graphics (in the cutscenes at least) because the characters actually look like they were drawn first and could belong to a Pixar movie. I guess, seeing how today polygons are not a problem anymore, if you were to design a new Crash character, like a Platypus or a Tasmanian Devil or something, would you still keep him simple to make it feel in style with the other characters? In my opinion through years of experience I feel that a simple character design is in many ways more difficult to master than something complex. I see this in practice every time I conduct a class in character design at my school. Breaking down a character's look to the simplest possible graphic statement you can make is one of the biggest challenges my students struggle with. That's one reason why they get so good. That and sound basic drawing skills. Once the foundation of the character's look is established it's a lot easier to add complexity to the design. I would really love to attend one of your classes one day just to see how you work and get to know the "strategies" for a perfect character design. For many years I dreamed of becoming a Concept Artist in the videogame industry, but sadly I never had the proper education and here in Italy Videogame development is not as big as in other parts of the world, especially in the USA. But despite all that I'll continue to draw and improve and maybe one day I'll get lucky and someone from an indie company will notice and I'll fulfill my dream, who knows! I wouldn't say it is down to what is particulary popular in each country regarding art and trying to get a job in video games. If you watch a game's credits you'll see names from many a different culture. Don't put it down to luck, work hard and believe you can make it. I have a saying that I live by. Don't just follow your dreams, have your dreams follow you. Keep striving for excellence and sooner or later people will offer you money for what you do. Usually to help them make their projects or make them better. Sometimes for what you create on your own. Either way have a good time and enjoy the fun. That's how I see it. I'm working towards getting video up on YouTube of some of my lectures on character design. Once you get these principles your art will improve. Well, Italy is no the best country, especially for videogames and comic books, two things that I love by the way. So yeah, the possibilities of fullfilling my dreams are really far away at this moment. I am actually studying to be a paleontologist one day, a dream that comes form Jurassic Park, my favourite movie of all time, but even that is really difficult and once you got your degree and can be called a paleontologist, USA is always the best place to work with that. Sadly here we don't have many possibilities, that's why so many people every year leave our country to find a job. Guys it's that way in many places over the world. When I was trying to become a professional artist I had to leave home too. In the US you can get in a car and drive 2000 miles or kilometers and live in a place where they do what you want to do. Today in animation and any creative business it matters less and less where you're located. For the first time in history you can work in teams from remote locations. It's all about how good an artist you are and getting your work online to be seen. Riot Games in LA hired a gardener from China to work for them when they saw the fan art he was coming up with. So its definitely possible but it all comes down to how good you are and what you are saying creatively. Love what you do in life and strive to be the best you can be at it. Do what ya gotta do to make it work. With art it's all about creative productivity and skill. So practice practice practice. That's what the pros do all the time.